Paramount Pictures has hired Ron Nyswaner to pen the screenplay for “Dover,” based on the landmark 2005 trial that stopped a Pennsylvania school board from teaching “intelligent design” — i.e., creationism — over evolution. Lynda Obst is producing for the studio through her Par-based shingle. The town of Dover, Penn., was torn apart by the trial, which essentially pitted religious faith against Darwinism in explaining the origins of life. A federal judge ruled intelligent design is a form of creationism, the teaching of which is generally frowned upon, since it brings religion into the classroom. Seven more episodes have been ordered of Veronica Mars, adding up to twenty total. I guess CW is too cheap to put in a full order of twenty-two, most likely requiring them to cut the planned third arc to only four episodes. In case anyone who follows the show hasn’t heard by now, instead of having one season long mystery, CW is catering to people with shorter attention spans by having three arcs this season. All in all, it wasn’t a good week for CW’s Tuesday night girls. Veronica got an unexpected hair cut (which would have been even more dramatic if they hadn’t shown the parking lot scene in all those previews). 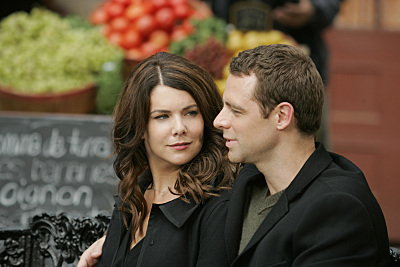 Meanwhile, Lorelai Gilmore got married to Christopher, and in the end appears to have second thoughts. I bet we haven’t seen the end of her and Luke. Personally I don’t care if she’s with Christopher, Luke, or anyone else. I just hope they can recapture that dialog from the Amy-Sherman Palladino days. Every now and then there’s a glimpse of it, but no consistency. « Rove On Way Out?